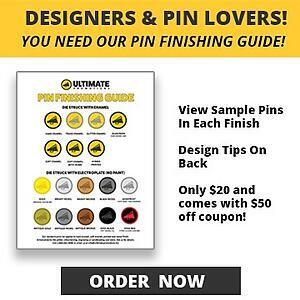 Metal pins without paint offer a whole host of creative choices to the enamel pin designer. Once you leave the color out, you can utilize engraving textures or sandblasting to achieve gorgeous artistic effects! 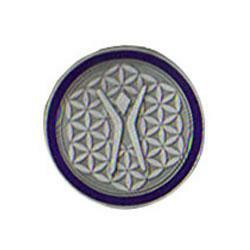 Our factory offers 12 different textures for your custom pin design. CNC mold making technology makes it possible to create a lot of different looks be it in the background of your design or featured front and center. You should consider using a background texture when you are trying to create a contrast between art elements. The textures vary from gravel-looking to that of a dulled look. The process is cheaper to administer than sandblasting. The difference is that the pattern is engraved into the mold which is then used to stamp out your pin blanks. Textures 1 and 2 resemble sandblasting the closest. The airline pin below, has a stamped texture in the background. Aside from the cost issue, it's our opinion that sandblasted render some of the nicest artistic results. Especially when combined with transparent enamels. Of the three choices in this article, sandblasting is the only one that costs more. The process is labour intensive. Each pin is stamped, trimmed and buffed. They are then added to flat racks and then inserted into a sandlbasting machine. The machine uses intense air pressure to "blast" sand particles into the surface of the pin. It delivers a nice dull looking surface. 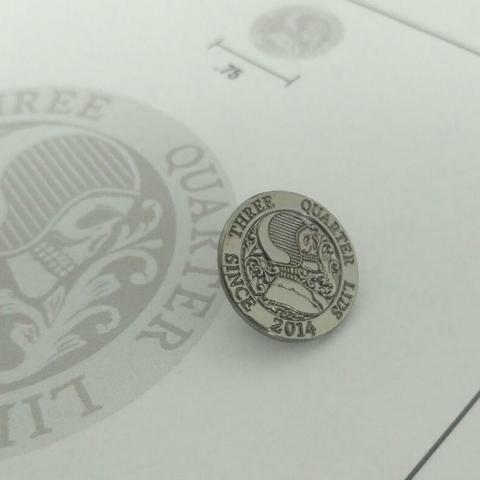 The factory then buffs the top layer of the pin so that the edges, lines, text or raised details appear shiny. Another technique you can use is antique electroplating. This process administered when dipping the pins into a series of chemical baths. The pin bases are attached to a metal rack and there is an electric charge given to the pins when immersed in these baths. Depending on the makeup of this bath, they can add a black tarnish to the bases. 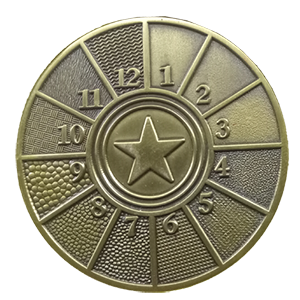 For no extra charge, we can dip your pins into an electroplating wash that gives it an aged look. We suggest using this technique of faces, old buildings or other forms of art that require a distressed or aged look.